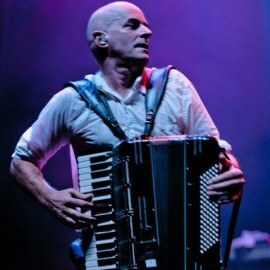 James Fearnley was a co-founder and the accordionist for the London-Irish celtic-punk band The Pogues. The Pogues took off into international renown in 1984 ditching 12 years later with the firing of their lead singer. Reunifying in 2001 The Pogues played around the world until 2014. Upon his departure from the band in 1993 James emigrated to the United States, to form The Low and Sweet Orchestra, whose debut album, Goodbye to All That, was released to much acclaim. In tandem with his recording career, James committed himself to writing a memoir about his life with the Pogues. Here Comes Everybody: the Story of the Pogues was published in 2012 by Faber and Faber, and in 2014 by Chicago Review Press. With lyricism and great honesty Here Comes Everybody captures the young friendships, the arguments, the gigs, the highs and dramatic lows in a compelling, humourous, moving and candid account of life in one of the Western world’s most treasured and original bands. The author’s own recording of his memoir is available from Audible UK. It includes music recorded by Fearnley specifically for the audiobook.